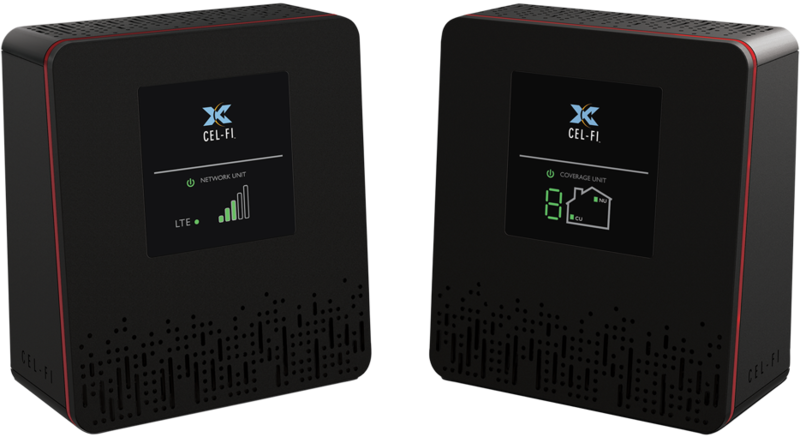 The Cel-Fi DUO/DUO+ are designed to dramatically improve HD voice and data coverage in up to two bands for 3G/4G/LTE for consumers while significantly improving network. Good things do come in small packages: With 3G/4G/LTE support, Cel-Fi DUO/DUO+ are compatible with the highest data services application available. All new patented echo cancellation algorithms enable Cel-Fi DUO/DUO+ to offer even higher signal levels throughout the coverage area than before. 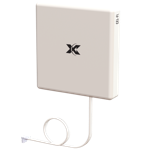 Cel-Fi DUO/DUO+ improve 3G/4G/LTE cellular service by eliminating dead zones and dropped calls. With up to 100dB of gain, it will improve cellular service and reduce your cell phone’s power requirements to extend its battery life. 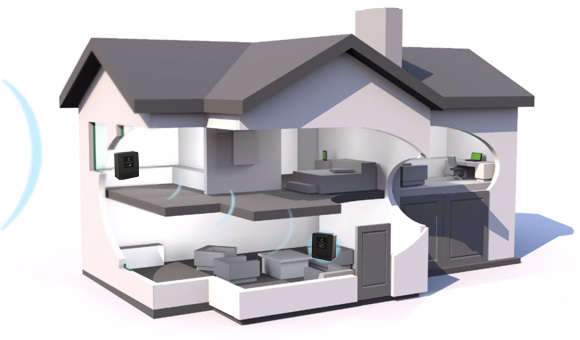 The Cel-Fi DUO/DUO+ cover up to 15,000 square feet (1,500 square meters) of indoor space per system. It’s fully self contained and self-configuring, requiring no external antennas or wiring required. Simply plug it in to boost indoor cellular coverage. 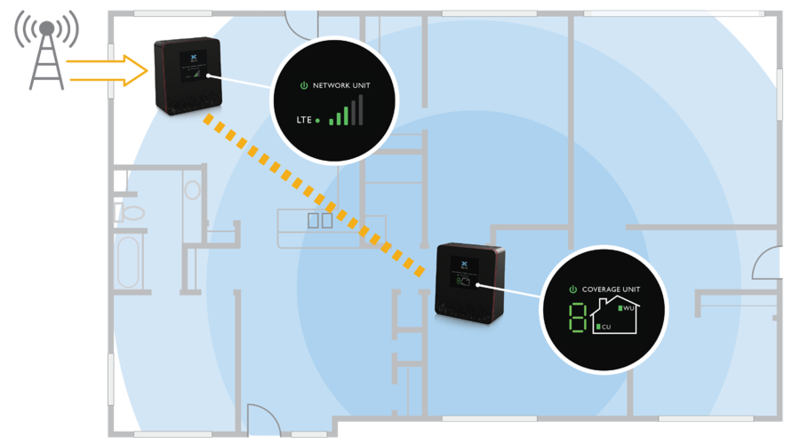 Move Coverage Unit further away from the Network Unit to maximize coverage. The total coverage area equals twice the distance between the Network Unit and the Coverage Unit. The maximum distance is up to 100 dB path loss. 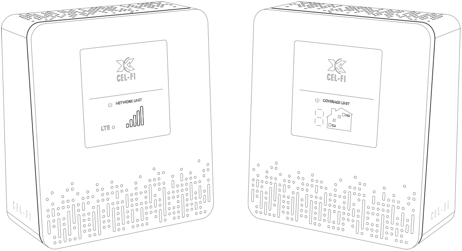 Cel-Fi DUO/DUO+ are available in multiple configurations for use in The Americas, Europe, Middle East, Africa, and Asian Pacific regions. 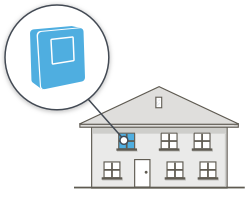 Place the Network Unit (NU) in the location where you get the best cellular signal. 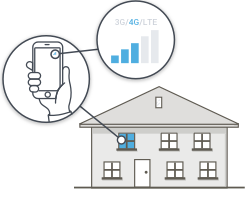 Place the Coverage Unit (CU) in the location where you need improved coverage. 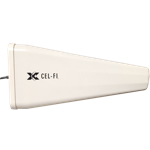 The Cel-Fi Wideband Directional Antenna is an outdoor vertically polarized highly directional antenna for Cellular Boosters; with 10 dB gain in the low bands and 11 dB gain in the high bands. The weather resistant housing is built with UV stabilized ABS plastic casing. 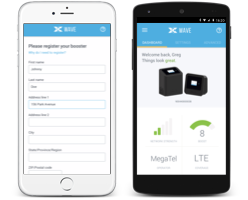 Optimized for Cel-Fi products, the Cel-Fi Wideband Directional Antenna can be used with the Cel-Fi WAVE Antenna positioning app. The unit includes standard brackets for mounting, and can also be used with the Cel-Fi Pole Mount. 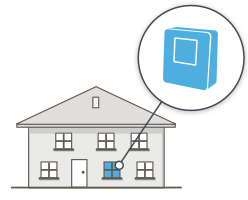 Find out where you can buy a Cel-Fi DUO in your region.